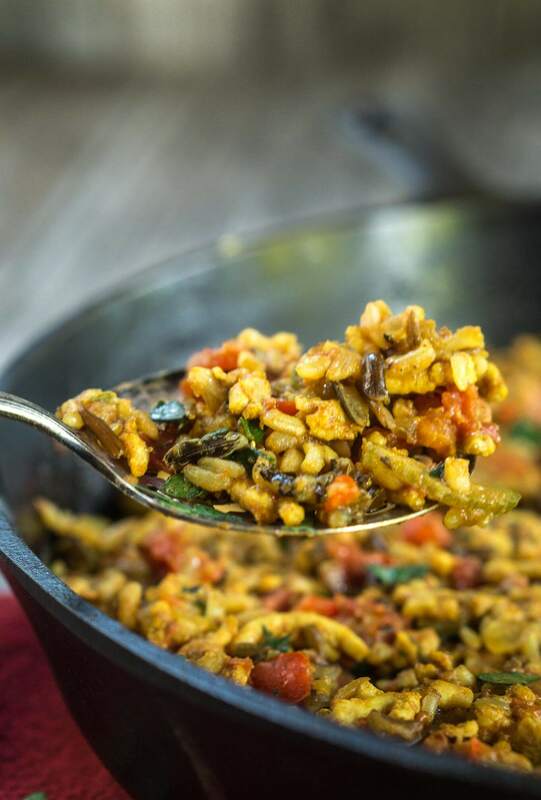 Turmeric Chicken with Wild Rice is a quick and easy dish that is just as healthy as it is delicious! It’s comfort food without the guilt. 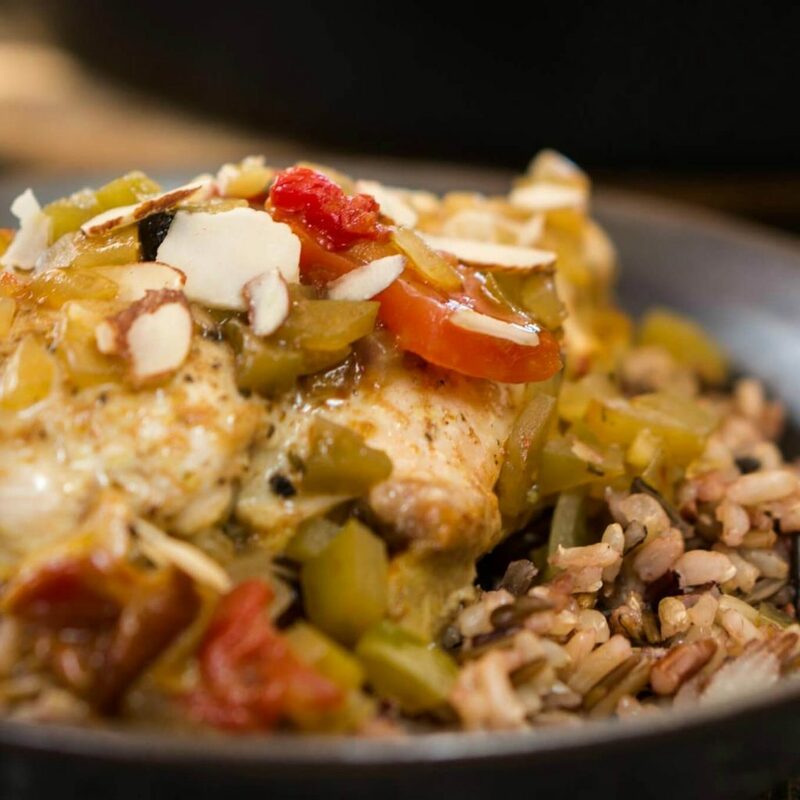 Turmeric Chicken with Wild Rice is the type of dish that is responsible for my blog. Raising my children I often put dishes together based on ingredients that I had at home. Once my children grew and were cooking for themselves, they asked how I made a particular dish. My daughter would get so mad at me when I just said I threw this and that into a pot. She asked “don’t you ever write anything down? How are we expected to make it?” Thus, Hostess At Heart was born. My sister gave me some ground chicken that she wasn’t going to use. My first instinct was to make my Turkey Sloppy Joes but I have been wanting to make a dish using turmeric. Turmeric has amazing health benefits and has been used by Chinese and Indian cultures as medicine. It intrigues me how these cultures figure out how to treat illness with ingredients like this! Do you think about that? We loved this dish. It was perfect for a quick dinner but still had comfort food written all over it without the guilt. Don’t have time to make it now? Pin it for later! 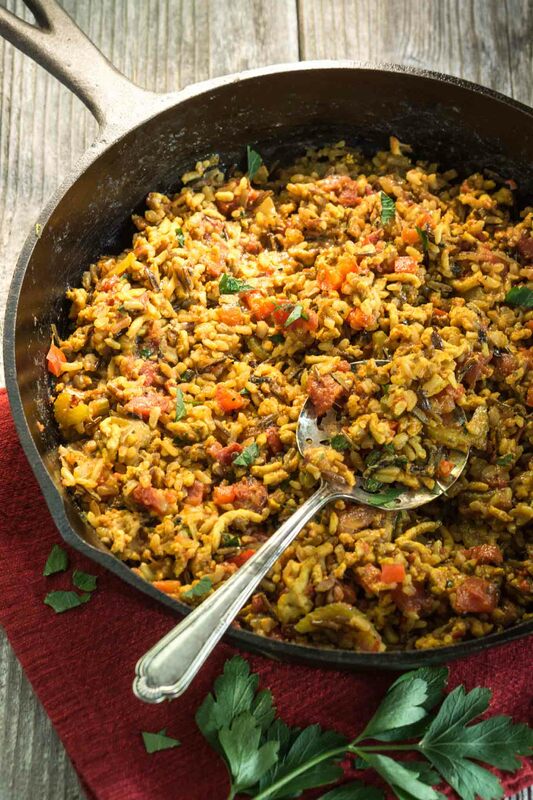 Turmeric Chicken is a quick and easy dish that is just as healthy as it is delicious! Cook the wild rice according to package directions. Tried this recipe? That's awesome!Mention @hostessatheart or tag #hostessatheart! 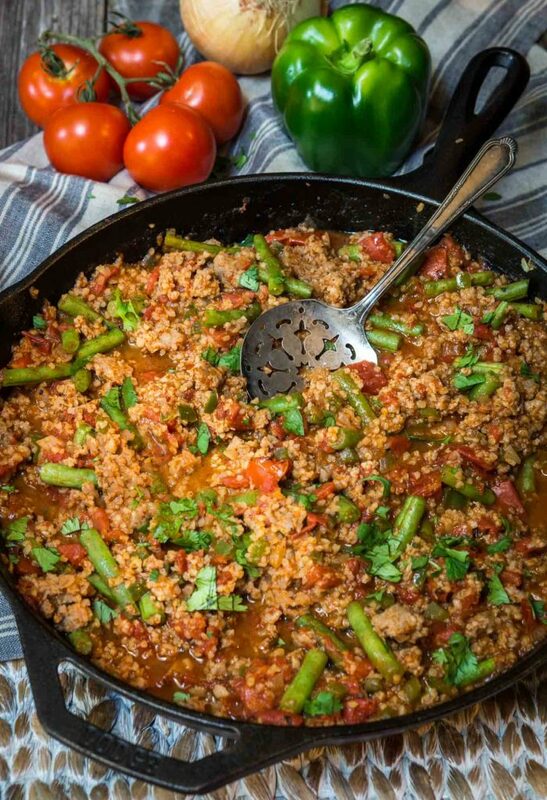 One-Pan Sausage Bulgur Wheat recipe! Let’s keep in touch! You can find me on Pinterest, Instagram, Facebook, Twitter, and YouTube! Better yet, enter your email address in the box below and never miss a recipe! I stumbled across your post while on a search to use some wild rice I had purchased at Trader Joe’s-so glad I did! I used ground chicken breast (personal preference) adding some chicken stock to keep up the moisture. The only other tweak I did was adding some diced carrot in with the initial vegetables for a true mirepoix. I am new to tumeric as well, so was happy to be able to incorporate it. My very picky husband went for seconds, so I am counting it as a success! Thank you! Forgot to mention that the addition of the red pepper is missing in the instructions. Thank you, Stacey! I really enjoyed this recipe and really appreciate you letting me know about the missing ingredient. I’ll fix it right away. I think John was a little hesitant trying this dish and loved it too. Thank you Marguerite! It was really good and easy to make. Please let me know what you think. 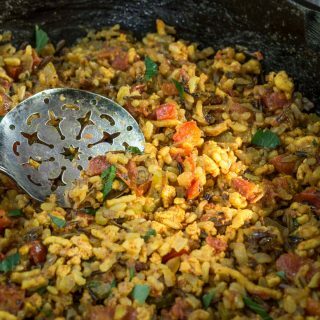 Never been a fan of wild rice but this looks so good I think I’ll have to try it again! I haven’t cooked enough with turmeric but I love the flavour and the colour. Your chicken sounds both healthy and so full of flavour! And I am glad your daughter got you starting the blog so we can all enjoy your recipes! Petra that is so sweet of you to say. I just love our blogging community! What a great story to the beginnings of Hostess at Heart! And what a fantastic dish – I’m loving the flavors in this dish! A spice I rarely use, but your dish sounds delicious. Thank you Donna. I am just starting experimenting with it and enjoying it too. I’ve heard about how healthy Tumeric is–I don’t have many recipes that use it, though, but this sounds like a great one to try! I am always looking for new recipes with turmeric. I love how filling and healthy this is. I bet your children are happy they can access your recipes now. I used to be the same way, and blogging really helps you keep a record of all your experiments 😉 Thank you for bringing this yummy dish to Fiesta Friday! Turmeric has antioxidants and is a great external and internal healer Julie!! Thank you Sonal! I haven’t used Turmeric much but sure am loving it. I LOVE when dishes come together effortlessly and use ingredients you’ve already got on hand, and this covers both. It looks mouthwatering! Thank you Justine! It was very easy to throw together and easier to eat! Thank you for the tip Sarah! I’m all for natural ingredients and turmeric sure has a lot of benefits. Love this Julie! I always say that I want to get more turmeric in my diet. It is so good for you. Pinning this for later consumption. Thanks for sharing! Thank you Debbie. This spice sure has a lot of health benefits. It was pretty new to me but we really enjoyed the flavor. I’ll be using it more often. 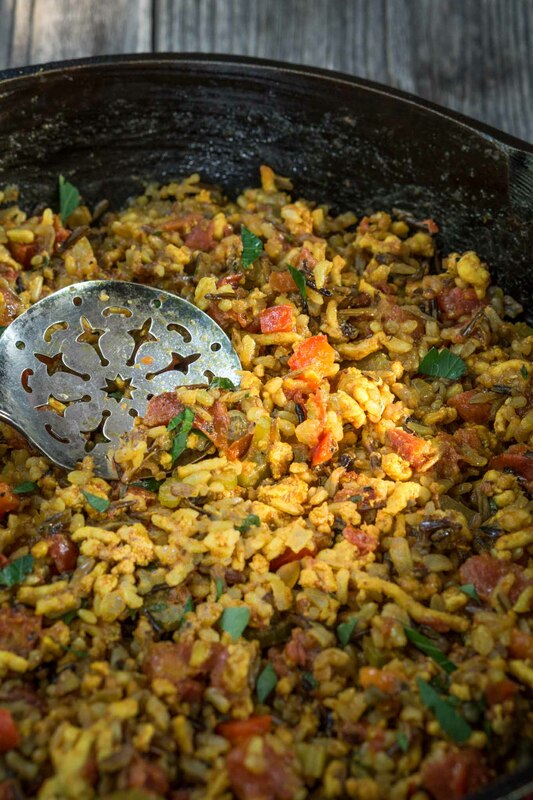 Julie that looks so delicious, love that you used wild rice in this recipe. It’s a fabulous one pot meal. Thank you Suzanne. I do love a simple dish with simple clean up! Yes, that is how I cook too, at least when not for the blog. I have had to get myself into the habit of writing things down! Love turmeric, this looks amazing! Thank you, Meghan! I love everything you cook! Thanks Jess! I am pretty new with turmeric and loving it!